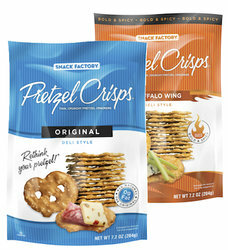 Snack Factory Pretzel Crisps. Pretzel Crisps are a modern twist on an old favorite. They're the best part of the pretzel-all the flavor and crunch you love-but lighter, crisper and more versatile than ever before. We have 2 great flavors to choose from: Original and Buffalo Wing. Each bag is 3 oz.